To purchase from Saskatchewan Publisher's Group click on book image. © COPYRIGHT: the author holds copyright on all material below. It cannot be republished or copied for educational use without permission. Jack Bush (1909-1977) A major Canadian painter. Adolph Gottlieb A recent essay on the great and much underrated American painter. John Griefen A catalogue essay on the American abstract painter from the Sharecom Fine Arts index. Peter Hide An essay on the British/Canadian sculptor. Morris Louis An essay on the great American painter. Terence Keller An abstract painter from Edmonton. Art McKay (1927-2000) A major Canadian painter. Appreciating Noland. Excerpts. For complete text check out the Kenneth Noland web site. Jackson Pollock: Energy Made Visible. a book review. James Walsh An outstanding abstract painter. CLEMENT GREENBERG A site devoted to the writing of the great critic. 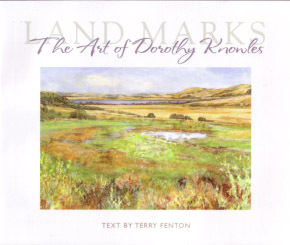 Watercolor Landscape in England and the Canadian Prairies. A Virtual exhibition with text. En Plein Air. An account of the development of painting landscape directly from nature. A. C. Leighton A catalogue essay on the Canadian landscape painter. Leighton was an outstanding English watercolour painter who came to western Canada in the late 1920s. Also from the Sharecom Fine Arts Index. The Picture Book. A brief book about pictures written for the general public and published by The Edmonton Art Gallery in 1978. Pre-Pictures: Fayuum. The first "oil paintings"? Disequilibrium: the sculpture of Tilman Riemenschneider. The great contemporary of Durer and Grunewald. The Materials of Painting. Some thoughts on the history of oil painting, taken and modified from Jules Olitski and the Tradition of Oil Painting, an Edmonton Art Gallery catalogue from 1979. St. Francis in Ecstasy. A look at the great Giovanni Bellini painting in the Frick Museum. SINCE THE LATE '60s Terry Fenton has written about art -- past and present, international and Canadian -- in international magazines, museum catalogues, and books both as as a freelance critic and curator as well as museum director. His writing includes books and major catalogues about Jack Bush, Sir Anthony Caro, Jules Olitski, and Kenneth Noland. A complete list of his writing can be found in the CV, attached. The following presents a sample of his writing -- mostly brief notes concerned with the nature and history of pictures and (mostly) Western sculpture. Some were done as exhibition catalogues or museum publications, others for art magazines, some are unpublished. The latter are very much fragments of work in progress. Material will be changed, revised, or augmented every couple of months.